This week in Inbound Marketing Highlights, we're covering new uses for AR technology, a major photoshop fail, and Domino's strangest pizza promotion yet. Read all about these stories and more below! We often discuss the amazing benefits of augmented reality in marketing, but in actuality, this technology has many other uses. If you don’t know what AR is, you probably would recognize it from the cool Snapchat filters that add fictitious objects to your images. But most recently, this technology has been used to visualize the potential effects of hurricane Florence. With many Americans not taking the weather updates seriously, this visualization helps everyone understand the potential impact of the storm, which is estimated to reach 9 feet of flooding. 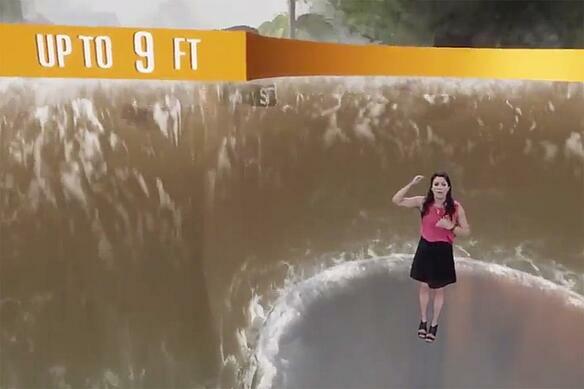 The meteorologist in this video is seen with the augmented flood image, portraying what the flooding will look like once it hits. Facebook is changing the way that they do ads. In a recent blog post, they have announced new features like publisher lists, publisher delivery reports, in-stream videos, and Instant Articles. The idea behind these additions is so that advertisers can see where their ads will be delivered before starting a campaign. In a different blog post, they also announced a name change from Canvas ads to “Instant Experience”. New forms, templates, and functionalities will be added under this new advertising platform. Users will also be able to integrate Facebook Pixel and their parties pixels into their campaign. These can be tracked for engagement in order to compare performance. What Emotional Connections Mean for Brand Loyalty. According to the Brand Keys 2018 Loyalty Leaders list, the top three leaders in brand loyalty this year are Amazon in online retail, Google for search engines, and Apple for smartphones. From this annual report, data shows that digital brands are managing to retain customer loyalty, even after negative publicity. But even more interesting is that non-digital brands are showing the biggest gains with building emotional connections, are therefore gaining a larger share of the market now. Through evoking emotional responses from customers, brands who are digitally behind may be able to break into this subset of loyalty brands. Reebok, T.J. Maxx, 5 Guys Burgers & Fries, and Zara are all brands that have been added into this top 100 list, some for the first time ever. Would You Get a Domino's Pizza Tattoo? Speaking of brand loyalty, would you get a permanent tattoo for a free pizza? Apparently 350 people would! When Domino's Russia ran a promotion giving fans a free pizza in exchange for a tattoo of their logo, they were not prepared for the public's response. The rules were simple; to become eligible for a free pizza, participants needed to get one of the pre-determined tattoos, and then post a picture of it on social media. What Dominos didn't plan for however, was the large number of interested contestants. While they were initially planning on giving away 100 pizzas, 350 ended up submitting images. In result, they pulled the offer to avoid a huge monetary loss. There’s isn’t much more horrifying to marketers and designers than a massive photoshop fail. And one that has been circulating on social media lately, has ironically been done by an art school! An art school in France called, Émile Cohl, is under scrutiny for photo-shopping darker skin tones into a group photo of their students. A former student was able to expose them by posting a picture of the original photo, as well as the altered one side by side. In the future they should focus their efforts on inclusive recruiting, rather than offensively photoshopping diversity into their images.